Finding myself with a bit of bonus money, I recently purchased a new point and shoot camera. My old one is outdated (~6 years) and I don't always want to whip out my dSLR, so I figured it was time. 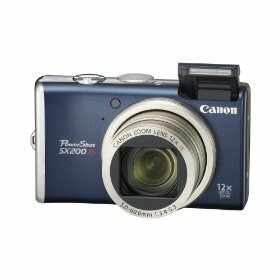 After doing some research, I opted for the recently released Canon PowerShot SX200IS. Although a bit more than I wanted to spend, it seemed to be the right option for me given its various offerings. I'll probably post a review after I use it for awhile; in the meantime, here are the reasons I picked it over some of the smaller models. Canon. It's no secret I prefer Nikon for SLR, so this might come as a contradiction. Having done enough research to recommend cameras for others and actually using a bunch of Canon P&S myself, I can comfortable say they make the best ones. Zoom. What can I say, I'm a zoom snob. I feel incredibly restricted by 3x and even 5x is a bit short for my taste (I use an 18-200mm [11x] on my dSLR ) so I was immediately attracted to the 12x (28-336mm) this model offers. The camera is not a "super-compact" as a result of all that glass, but with a 3" LCD to make up for it, I'm okay with that. HD Video. I've really gotten into the whole making thing and had been thinking about upgrading my dSLR to compensate. With a pocket camera that shoots 720p, video is no longer a requirement when I do eventually upgrade. Modes. Again, it might be the photography snob in me but I don't think I ever want a camera that doesn't have aperature and shutter priority modes. My 6 y/o P&S was originally purchased because it has them (and I wanted to learn about them) so anything without would be a downgrade. Random Goodies. Blink detection, face detection self-timer, red-eye correction, face tracking and pop-up flash... I'll let you figure out what all those things do/mean.